This tree is native to South East Asia including Indonesia and Malaysia. The tree features hanging roots which is so easy on the eye and creating unique impression. Scientifically known as Ficus benjamina Linn, in Indonesia it is known as beringin and in English is known as weeping fig. The air roots covers the real tree and closer to the real tree usually the diameter if the air roots are bigger. The air root absorbed oxygen, while if the root touches the soil it can absorb water. There are some case that the tree becomes invasive. In Indonesia, this tree is believed to be sacred. Weeping Fig can function as micro climate creator. The canopy is big size ad it is an evergreen tree, that mild the temperature. And no wonder that the tree is planted at parking area, city square, and also cemetery. 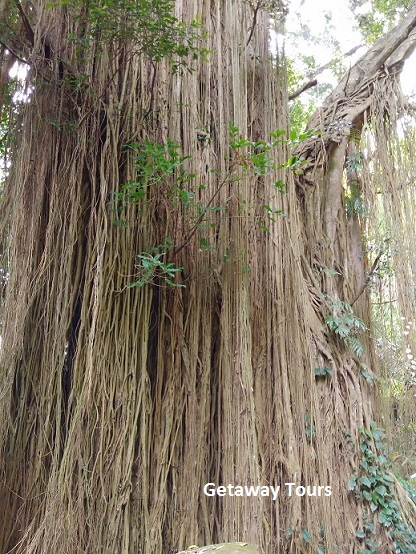 Weeping Fig is a species with high ecological value. Its characteristic as Epiphyte, semi-epiphyte and independent tree enable the tree to live very long., and in some areas can live until hundreds years. Economically, the ficus tree is not so tough that it can not be used for housings or furniture. But when the tree lives, it is very useful environmentally, as it is the habitat of birds, some reptiles, insects, and mammals. The fruits which can be found the whole year can be the diet of the animals. And the air root can be functioned as playground for primates. If you want to visit the Giant Banyan tree in Bali, please inform us: Getaway Tours: Indonesia Tour operator.